As part of the full-service marketing partnership between Carls Patio and MDG Advertising, our agency is developing the branding, creative services, media planning and buying, digital marketing, SEO, and social media for Carls’ 9 Florida stores. In addition, MDG is evaluating and restructuring their digital platform, including PatioFurniture.com, and developing the Fifth & Shore identity in conjunction with the Carls Patio rebrand. 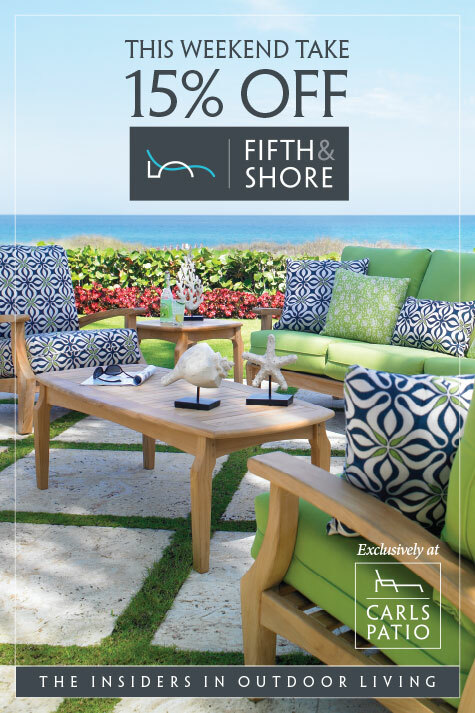 Fifth & Shore is a new concept in outdoor furniture from Carls Patio. It enables the customer to choose from classic to contemporary patio styles, and personalize their selections with coordinated collections of durable designer fabrics and sturdy materials that can withstand the elements. This allows the customer to infuse their unique style into their outdoor environment. In designing the new logo, MDG’s team strived to produce a symbol that connected the Fifth & Shore line to Carls Patio, while clearly communicating its distinction as a separate customizable entity. This goal was accomplished by utilizing the simplified graphic chaise lounge from the Carls logo and modifying it to be built out of a “5” and an “S” to reflect the Fifth & Shore name. While the logo for Carls Patio is a single color, our creative team used two colors for the Fifth & Shore logo design to both distinguish the line and convey its customizable quality. To learn how creative logo design and savvy branding can increase your retail brand’s appeal to consumers, contact MDG Advertising today at 561-338-7797, or visit mdgadvertising.com. MDG Advertising, a full-service traditional and digital marketing agency with offices in Boca Raton and New York, NY, specializes in developing targeted Internet marketing solutions, exceptional creative executions and solid branding and media buying strategies that give clients a competitive advantage. Our core capabilities include branding, logo design, creative, digital marketing, print advertising, media planning and buying, TV and radio, website design and development, email marketing, social media marketing, and SEO.